Between summertime steaks, burgers, and dogs on the grill and cold-weather classics like beef stew, meatloaf, and chicken pot pie, meat is arguably the primary component of the American diet. 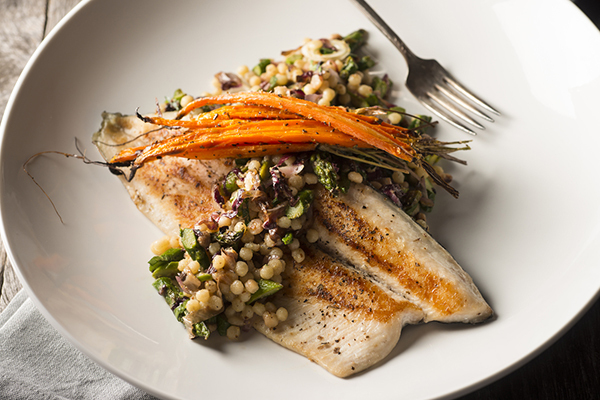 Chicken, turkey, and fish are convenient, familiar sources of lean protein. Additionally, meat is both widely available and affordable. But despite the many health benefits of a plant-based diet, Americans remain primarily meat eaters, consuming more than 215 pounds of meat, poultry, and fish per person, per year. So what’s a meat-loving health enthusiast to do? 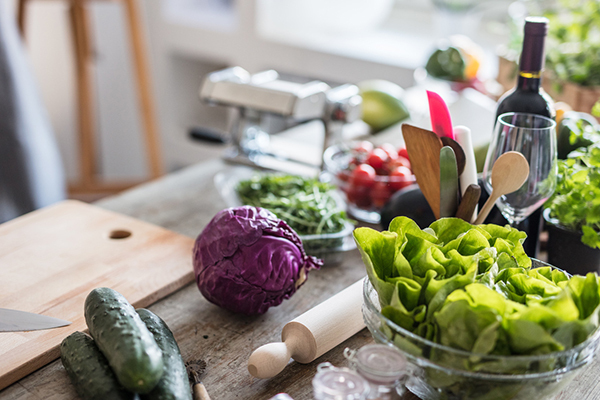 For those who just can’t wrap their head around becoming a vegetarian, the flexitarian diet can be a great alternative. The term “flexitarian” refers to a person who has a primarily vegetarian diet, but occasionally eats meat or fish. A mashup of the words “flexible” and “vegetarian,” the term flexitarian describes someone who consumes more fruits, vegetables, legumes, whole grains, and plant proteins and less meat than someone eating the standard American diet, which is high in meat, dairy, saturated fat, sugar, refined grains, and processed foods. The flexitarian philosophy also puts emphasis on adding more whole, minimally processed foods to your diet rather than restricting less healthy ones. The essence and appeal of the flexitarian diet is that it’s flexible and not overly prescriptive. Unlike other diets with strict food rules and rigid meal plans that promise drastic weight-loss results, flexitarianism fosters sustainable healthy eating habits that can help you shed pounds and improve your health in the long run. “Flexibility is the secret ingredient to why this plan is easy to stick with long-term,” says Dawn Jackson Blatner, R.D. and author of The Flexitarian Diet: The Mostly Vegetarian Way to Lose Weight, Be Healthier, Prevent Disease, and Add Years to Your Life. It’s also why the flexitarian diet appeals to so many people — there’s not just one way to be flexitarian. Blatner uses a stepwise-approach to flexitarianism, whereby beginners start off eating two meatless days, or six vegetarian meals per week, and gradually work their way up to expert status, five or more meatless days or 15+ vegetarian meals per week. Other flexitarians, like popular food writer and cookbook author Mark Bittman, choose a time-based strategy. In his book, VB6: Vegan Before 6:00, Bittman shares his flexitarian tips for eating a vegan diet — but only until dinnertime. After 6pm, Bittman becomes unapologetically omnivorous — and has managed to lose 35 pounds and improve his metabolic health in the meantime. The beauty of the flexitarian diet is there is no right or wrong way to do it. You don’t have to go without meat two, three, four, or five days a week or eat strictly vegan before a certain time of day. The most important part of the flexitarian diet is not the number of vegetarian meals or days you begin with, but how many more you eat now than before. The flexitarian diet has lots of upsides, hence it’s dramatic growth in popularity recently. The most obvious advantage of this diet is its flexibility. 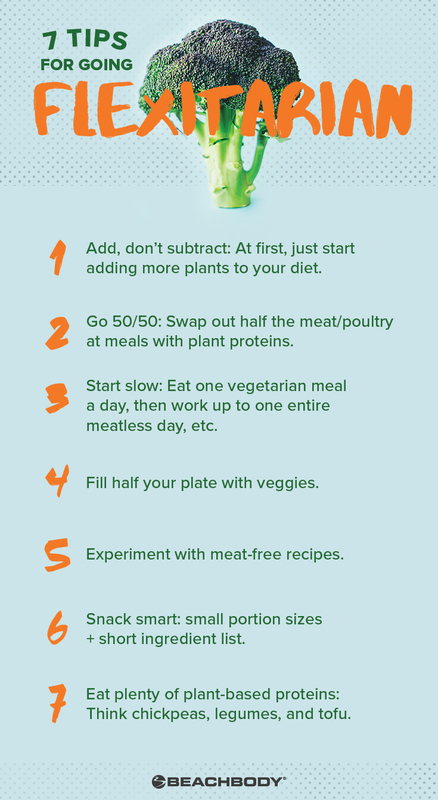 You can ease your way into a flexitarian lifestyle simply by adding one or two more meatless meals to your eating plan each week and gradually increasing the number of plant-based meals in your diet at your own pace. For this reason almost everyone finds this diet approachable, from the biggest of meat eaters to those with a family to feed. Another perk of flexitarianism is there are no “off-limit foods” with this diet — within reason, of course. As with any healthy-eating diet, flexitarianism encourages whole foods over processed foods. Not having to completely give up meat while still getting the health benefits of a plant-based diet is also a huge plus. When it comes to getting healthier, research shows that the more plant-based the diet the better but, “you don’t need to exclusively eat plants to get these benefits,” says Blatner. Plant-based diets tend to be higher in fiber, vitamins, minerals, antioxidants, and phytonutrients, which collaboratively promote good health and support the body’s major functions, including digestion, metabolism, cellular growth and repair, immune function, and more. They also tend to be lower in calories and saturated fats, which promotes healthy weight and heart health. It goes without saying that eating a mostly plant-based diet, as flexitarianism endorses, will support many of these same health benefits. Add, don’t subtract. Adding foods to your diet naturally crowds out those you want to eat less of without igniting feelings of deprivation. “Don’t worry about going vegetarian at first, just start adding in more plants… think fruit, vegetables, whole grains, beans,” says Blatner. Do the 50/50 swap. Blatner also suggests eating half as much poultry and meat at meals and adding plant proteins such as black beans, pinto beans, white beans, kidney beans, edamame, and lentils, to fill the gap. Snack smart, keeping portion sizes small and ingredient lists short. Mark Bittman relies on fresh fruit and nuts within moderation, both of which provide energy and fiber for satiety. Get plenty of plant-based protein. Protein has a lot of perks when it comes to weight loss, helping with everything from satiety to reducing loss of lean muscle mass. Legumes, lentils, tofu, and tempeh are all great sources of protein. “I’m a big fan of legumes — especially white beans, lentils, and chickpeas,” says Bittman in VB6. Additionally, don’t forget to keep portions in check and put emphasis on balance, and try to follow the 80/20 rule as much as possible. Wondering what a flexitarian menu might look like? It’s more delicious than you might think. Blatner suggests a breakfast of peanut butter and banana oatmeal, a black bean and guacamole taco salad for lunch, and lentil (or chicken or beef) meatballs served over zucchini noodles and marinara sauce for dinner. If hunger hits between meals, she recommends simple, whole foods, like an apple with almonds or plain yogurt with fresh or frozen berries. You’re probably wondering: Are there any downsides to this diet? Try it for a week and you’ll find flexitarianism does take a bit of planning, since it forces you to outline what meat-free meals you’ll be eating each week, but that may not be a bad thing. 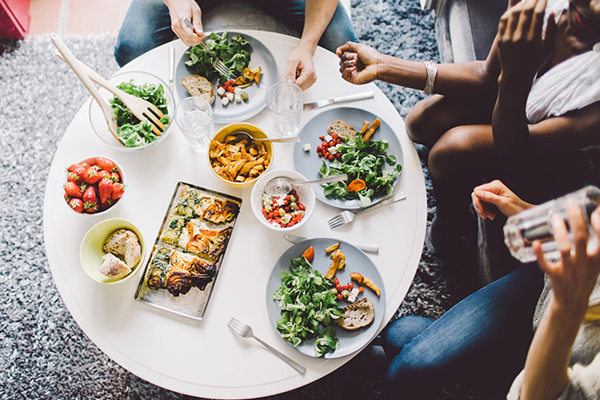 This flexible approach to healthy eating encourages you to eat more, not less, all while helping you achieve a healthy weight and improve your health. The key, Blatner says, is to “wake up every day with the intention to eat as many plant-based meals and snacks as possible” — and be flexible about the rest.